The traditional “welcome” parade of new and established Chiang Mai University students from the CMU campus to Doi Suthep mountain took place recently, beginning at the gates of the university with a religious ceremony and a traditional Lanna performance from the Student Union’s Lanna Folk Club. The massive parade of more than 10,000 people, including posters, administrators and alumni, traditional Thai dancers and musicians and students from the university’s 27 faculties, moved off along Huey Kaew Road to pay respect to the Kruba Srivichai statue, then continued to Doi Suthep in order to pay homage to the auspiciousness and physical strength of Phra Boromathat. This “welcome” parade, which has taken place every year since the university’s inception in 1964, is intended to create unity between new and established students, alumni and academics. The Buddhist Holy Day of Ahsala Bucha falls this year on Thursday July 17, the 15th night of the full moon during the eighth month of the Buddhist Lunar calendar. “Ahsala Bucha” means paying homage and worshipping on the day identified according to the lunar calendar during the eighth month, Ahsala being the name of the eighth month in the Pali language. Ahsala Bucha Day commemorates three events which occurred on the same day in the life of the Lord Buddha; his first sermon, the “Dharmachakapavattama Sutta,” which outlines the “Four Noble Truths” and which was presented to the first five disciples; the birth of Buddhism itself on that day, and the creation of the Sangha, when the first person to hear the Lord Buddha speak became a Buddhist monk by pledging to follow the Buddha’s teachings. From these three events arose the “Triple Gem” of Buddhism, the Buddha, Dharma and Sangha. The sermon, which set in motion the “Wheel of Dharma”, (Dharmachaka), concluded that all things are a source of suffering from the constant cycle of birth, disease, old age and death; that desire or the inability to obtain what one desires is the cause of suffering, resulting from cause and effect; that freedom from suffering can only be obtained after the complete cessation of desire, and that only the “Middle Way” - the path between extremes of asceticism and indulgence - can lead to the elimination of desire. These conclusions, the “Four Noble Truths” are the basis of Buddhist philosophy - the Eight-Fold Path which leads to their full understanding consists of maintaining and practising correct views, resolve, speech, conduct, livelihood, effort, mindfulness, and the practice of meditation. Buddhism itself is considered to have begun on this day when, having left the location of his enlightenment, the Lord Buddha came to a forest area near the city of Pharansi, and gave his sermon, (the Dharma), to five ascetics, who immediately became his disciples. The third event, the establishment of the Sangha, (the Buddhist community), occurred as the first ascetic, having heard the Lord Buddha’s words and realised their truth, became the first Buddhist monk. Ahsala Bucha day, as a result, is also known as Sangha Day. The Thai government established the observance of Ahsala Bucha Day in 1958. Each year Buddhist temples throughout the Kingdom arrange ceremonies venerating the historic founding of Buddhism. Devout Buddhists participate in the ceremonies by presenting offerings to monks, listening to sermons and performing ritual prayers. The entire day is revered and certain precepts are adhered to by the more devout Buddhist community, and by those who have the inclination and opportunity to do so. The Wien Tian ritual ceremony is performed in the evening; worshippers go to nearby temples bringing candles, flowers and joss sticks and complete three circumnavigations around the temple area’s sacred grounds. The day following Ahsala Bucha Day, begins the traditional three-month period of time during which Buddhist monks must return to, and stay in, their temples, neither leaving nor staying overnight at another location, “for the duration of the rains”. Often referred to as Buddhist Lent, the correct name is “Khao Pansaa,” one translation of which refers to the beginning of the rains and the practice of returning. The day falls on the first full moon of the Buddhist Lunar calendar during the eighth month of every year, (July 18 this year), and is another important Buddhist holy day in Thailand. At the end of the three-month period the Katin ceremony, during which new robes are presented to the temples, takes place, after which monks may leave and go elsewhere. Originally, monks were discouraged from travelling during the rainy season as they might have accidentally stepped on the rice crops or the numerous small insects and other creatures. Inclement weather also made it difficult and dangerous to travel. Monks were therefore ordered to remain in their temples, studying and discussing the Buddhist scriptures, following the proper disciplines, meditating and performing ritual ceremonies. The tradition of Khao Pansaa has continued to this day with three classes of ceremonies, a Royal ceremony conducted by HM the King of Thailand, ritual ceremonies for devout followers of Buddhism throughout the Kingdom and ceremonies performed by monks in the temples. The Royal ceremony is similar to the ceremony performed by the general public, but more elaborate. HM the King and members of the Royal Family perform ritual ceremonies to pay homage to Buddhism, and present Khao Pansaa candles and traditional garments to Buddhist monks. The Royal Family also donates many other items used in these ceremonies. Lay followers of Buddhism all over Thailand will attend temples in the morning with flowers and candles in their hands, bringing food, necessities, money, traditional candles, garments and ceremonial items for the monks. Devout Buddhists may refrain from the recognised eight offences for the duration of the three month rainy season just as monks do, while others may give up a single vice, with yet others avoiding 5-8 offences for the day. The ceremonies performed by monks in temples revolve around rituals accepting new monks, who take vows for periods of up to three months, with some staying even longer. Senior monks at each monastery perform ceremonies which lead followers in worship and prayer. The two main items presented to monks during Khao Pansaa are candles and garments, specifically the bathing robe. Candles were essential in former times, needed both for ceremonies and for studying scriptures - the tradition continues to this day. The presentation of garments worn by monks is said to have originated from methods of bathing in former times, commonly done in community areas using streams, rivers, ponds and other sources of water, with monks requiring a bathing robe. The garments worn by monks continued to develop - the custom now includes presenting the entire arrangement of costume worn by monks. Both Ahsala Bucha Day, July 17, and Khao Pansaa, July 18, are recognized public holidays; banks and most businesses will be closed, and the sale of alcohol will be forbidden. Many people take time away from their work on Khao Pansaa to recognise the importance of this Buddhist holy day. Everyone is invited to participate in the temple ceremonies and to refrain from offensive behaviour for the day, and to make the same effort thereafter. Chiang Mai province has designated August 8-12 as Tree Planting Week, according to the deputy governor, Phairoj Saengphuwong. A project to plant 1 million trees in the province to commemorate HM Queen Sirikit’s birthday on August 12 has been under way since the beginning of 2008, and has resulted in a total of 840,000 trees being planted to date. The project is part of a nationwide scheme involving all provinces; the aim is to plant 76 million trees across the kingdom. All government and private sector organizations, state enterprises, students and the general public are asked to participate in planting the remaining 160,000 trees across the province during Tree Planting Week. The Nobel Women’s Initiative, established in 2006 by a group of women Nobel Peace Laureates will hold a special seminar at Chiang Mai University on Monday July 21, led by one of NWI’s founder members, Professor Jody Williams. International participants will include the UNICEF goodwill ambassador and American actress Mia Farrow, Chinese labour rights activist Qing Zhang and Dr. Sima Samar from Afghanistan. Discussion at the seminar will focus on the political-rights crisis faced by women in both Burma and Thailand. Video testimony by Daw Aung San Suu Kyi, (herself a Nobel Peace Laureate whose house arrest has recently been extended for another year), and others, will be presented and discussed, as will the systematic violations of women’s rights, the crackdown on democracy activists and the ongoing violence in Burma. A background of the ongoing situation in Burma will be presented, highlighting Aung San Suu Kyi’s situation, the regime’s criminal blockage of aid to Nargis victims and the situation of refugees on Burma’s borders who are continuing to flee from persecution. Statements from two Burmese women and from ethnic women in Thailand will also be presented. The President of the Foundation for Women, Law and Rural Development, Virada Somswasdi, stated that “We don’t have such a special event very often in Thailand, let alone Chiang Mai, so I do hope that it will create interest, more understanding and support for women’s causes. The efforts of NWI members and other women involved in the delegation to Thailand are not only to keep alive the issues of peace with justice and equality, which include violence against women and the crises of political rights, but also to highlight the importance of a just and peaceful global community for women.” Women’s rights scholar Kritaya Archavanitkul hopes the dialogue will promote the voices and unseen works of women to local governments. Twenty village entrepreneurs from Chiang Mai, Pettani and other locations recently took “get up and go!” a step further than usual when they got up and went, together with their products, to Kampung Bunut in Borneo. The small trade fair, which closes next Friday and is being hosted by the Thai Embassy, is the second held in Borneo, the first being in 2003. Various products are being shown, including woven materials, women’s jewellery and a selection of items made from disposable products. These last attracted the attention of a delegation of thirty members of Himpunan Parti Wanita Pembangunan Bangsa, a local organisation which also produces goods from disposables and sells them to benefit their welfare fund. The piece which particularly caught their imagination was a flowery brooch made entirely from fish scales - a very original idea! 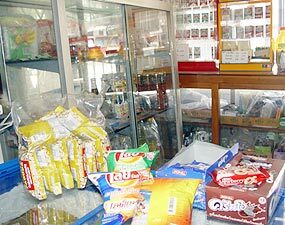 The deputy governor of Chiang Mai province, Pairoj Saengphuwong, has issued a directive to businesses regarding the practice of raising prices for goods and services unnecessarily, thus taking advantage of consumers already struggling with the rising costs of fuel and food, stating that such practices would be dealt with strictly according to the law during a three month period of observation. Consumer product prices will be subject to a three month period of investigation to prevent unnecessary rises. Pairoj also noted that businesses are able to use several strategies to avoid complying with the law, including quantity manipulation and refusal to deliver, and that the three month period of observation would help protect consumers from such practices. Enforcing officials will be chosen at random to perform inspections over the stated period, which started on June 20 and will continue for 90 days. Businesses or individuals found guilty of breaching the Price of Goods and Services Act in this way will be subject to a fine or imprisonment of no more than one year. The results of a project launched last year by Prof. Doungchan Charoenmuang and sponsored by Chiang Mai University’s Social Research Institute, its Faculty of marketing and its Fine Arts Faculty, were on display recently at Northern Village, Airport Plaza, pending an official opening in August. Entitled “From Waste to Value avoiding Burning,” the sales exhibition featured many items, including bags, flowerpots, handicrafts and works of art, all transformed from garbage and waste material by workers in three Chiang Mai villages, who had been trained for almost a year in this unique method of reducing burning and its environmental and health hazards. The UN’s recent Anti-Drugs Day was marked here in Thailand by the burning of confiscated drugs worth approximately $310 million dollars by drug enforcement officials. The conflagration took place in Ayutthaya; police personnel involved apparently experienced the residual effects from the burning bonfire of drugs. In developed countries, special incinerators are provided to protect technicians and the environment from contamination. Drugs burned included 2.2 kilos of cocaine, 32,000,000 tablets of methamphetamines, 1.1 tons of heroin and 7.2 kilos of ecstasy. 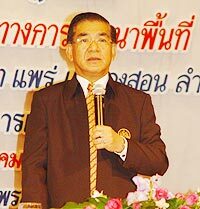 The health minister, Chiya Sasomsub, stated that the Thai government is determined to solve the drugs problem, as no Thai family wants their children to get involved in drugs which may damage their brains. He also estimated that there are at present approximately 200,000 drug users in the Kingdom. 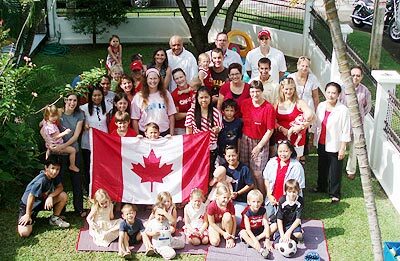 For the 126 Canadian families living in Chiang Mai, Canada Day, held annually on July 1, is a special day for celebration. Those who could make it this year joined up for the second annual “Stampede Breakfast” - a traditional breakfast of pancakes and bacon. 70 Canadians, including representatives for the Canadian Consulate, business professionals, NGO workers, missionaries, retired folds, and even a few “wanna-be” Canadians, enjoyed the meal and each other’s company. A seminar concerning the development of the upper northern provincial areas of Chiang Mai, Chiang Rai, Lamphun, Lampang, Phayao, Phrae, Nan and Mae Hong Son was held July 9 at the Empress Hotel, chaired by Somchai Chumrat, Director of Public Works and City Planning. More than 500 delegates attended. Somchai Chumrat, Director-General of Public Works and City Planning Department, pictured chairing the seminar. Discussions were held which stressed the need for each province to set up city development plans which were suitable for local communities, and which did not impact on the environment. Somchai stated that planning for fast-growing cities such as Chiang Mai needed cooperation and consultation between officials and residents as to the location of residential, hotel, entertainment and industrial districts. He mentioned that the areas in the upper north still had room for development, and stressed that the benefits of such development should not be confined to any one single group, but should be acceptable to all in the community. The Governor of Mae Hong Son, Thongchai Wongrianthong, recently attended a stressful meeting with concerned parties regarding the recent abduction of 11 members of the Kayan sub-tribe of the Karenni people, often disparagingly referred to as the “long-necks”. The meeting also discussed ways to return the abducted tribespeople. Concerned relatives of the 11 abducted Kayan waiting for news in Mae Hong Son. During the meeting, Thongchai insisted that human trafficking laws would be observed and that those who failed to observe such laws would be punished. He added that letters requesting cooperation would be sent to Chiang Mai, Chiang Rai, Chonburi and other major tourist provinces in order to determine whether fake Hill Tribe villages had been set up to exploit the Kayan as tourist attractions. Concern was expressed that foreigners and their governments would consider that Thailand was encouraging inappropriate treatment of refugees. Mae Hong Son officials will be sent to suspect areas to investigate. A task force has been set up comprising the deputy governor of Mae Hong Son, Mae Hong Son police, immigration police, labour officials, public prosecutors, administrators and representatives of the Northern Tourism Association with the aim of returning all Kayan to Mae Hong Son and taking legal action against the human traffickers, who will be charged with violating the Immigration, Human Trafficking and Employment Acts. At present, the whereabouts of the 11 abducted Kayan, including four children, remains unknown, but attempts are being made to verify the routes used in the abduction. Karenni villages in Mae Hong Son province are also being investigated. 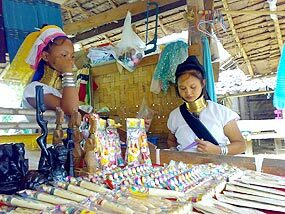 The Kayan are considered as refugees, having fled from the heavy fighting in the Burmese border areas, and are required to stay at designated locations. Controversially, the governor insisted that, contrary to claims made by the United Nations High Commission for Refugees, (amongst many others, including members of the Kayan themselves), the refugees are not badly treated, as Mae Hong Son province has established its own tourist sites, (referred to as “conservation villages”) where they may live in their “natural surroundings” and lead a “normal way of life”. Presumably referring to Huay Sua Tao and Huay Pukaeng, he mentioned that tour operators are involved, which, he said, protects the refugees and ensures that they do not move elsewhere to the detriment of the Mae Hong Son tourist industry. UNHCR recently accused Thailand of being more concerned about tourist revenue than human rights. The British Council has announced a series of talks to be held in Chiang Mai under the title of ‘A Festival of Bright Ideas’. The Education UK talk will cover essential issues for Thai students who plan to pursue their education in the United Kingdom. Government ministers and representatives of local administration departments met July 7 in Chiang Mai to discuss a plan for construction of the new International Convention Centre and Exhibition Hall, to be situated near the 700 year Anniversary Stadium. Also on the agenda was the upgrading of the Ratchapruek Royal Flora Expo Park, to be completed in time for the celebration of His Majesty the King’s birthday on December 5. The leader of the Chart Thai Party, Banharn Silapa-archa, together with the Minister of Agriculture, Somsak Prisananantakul, and the Minister of Tourism and Sports, Veerasak Kowsurat, inspected Ratchapruek Royal Flora Expo 2006 Park. China, Japan, Bhutan, and Brunei will be invited to add their native floral displays to the exhibition in time for the December 5 celebrations held to honour His Majesty the King. In addition, Veerasak announced that the Ministry of Tourism and Sports is joining with the Ministry of Agriculture to organise the Lanna Culture Fair, which will take place at the Park each Friday, Saturday and Sunday throughout August from 10 am to 10 pm. For this event, the 8 northern provincial authorities of Chiang Mai, Chiang Rai, Lamphun, Lampang, Phrae, Nan, and Mae Hong Son will take turns to host the entertainments, cultural performances and Lanna arts on display. A drum contest is also being planned, to take place at the Park in October. Governmental approval for a planned budget of 40 million baht is being sought. Regarding the plans for the Convention Centre project, a budget proposal of an amount in excess of 2.3 billion baht, which will take into account increasing construction costs, will have been submitted to the Cabinet July 14 for further approval.